Before she was best known for being THE pop star in a feud with the ACLU, Taylor Swift had a mostly innocent and very popular Instagram persona. She posted photos of her cats Olivia Benson and Meredith Grey, her extravagant Fourth of July parties, and, obvi, her all-star ragtag celeb "Bad Blood" squad. Then in August 2017, she deleted everything she'd ever posted. 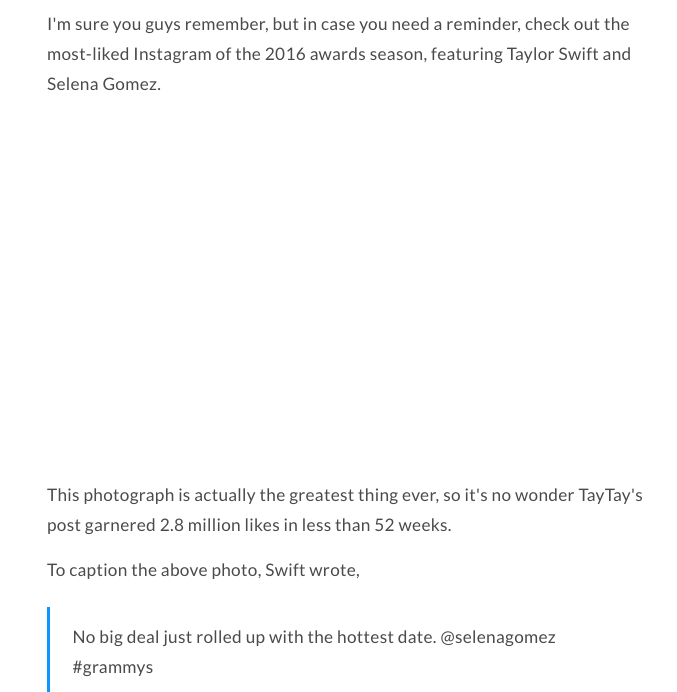 Swift's Instagram, Twitter, and Tumblr were all wiped clean in a marketing ploy/"Dark Taylor" rebrand just in time for her November 2017 album Reputation. But in establishing her blank slate, she left a gaping hole. In October 2014, I was not a Taylor fan and then 1989 dropped and I was. It was so fun! Every teen and teen-wannabe I followed on Tumblr was into her, it felt like, and her brand of femininity was one that my predominantly male coworkers glommed onto more so than they did with Kim K Hollywood, a phone game that had been released that summer which I had been hiding in the bathroom to play during work hours. I followed Swift on Instagram, fascinated and then eventually annoyed by her sheer ability to have anyone–even TV stars twice her age–join her sociopathic friend group. Yet, for all the posts I remember enjoying, I don’t remember many specific photos, only a general filter palette and good-girl social vibe. I search on Twitter, type "Taylor Swift 2014" into Google, and, painfully, dive into my own Tumblr archives to find any evidence. She dressed as a Pegacorn for Halloween in 2014, I find, and yeah, I reblogged it, I also find. What now that they disappeared? Is the answer to that really just, “Stop spending time looking at E! Online articles from 2014?” Maybe! Or is it “Look at them more, and get lost in the emptiness lol?” A cursory glance at her underwhelming “Bad Taylor” 2018 IG presence has me learning towards the latter.